One of you (or a bunch) can swing, spin, and soar on WebRiderz. 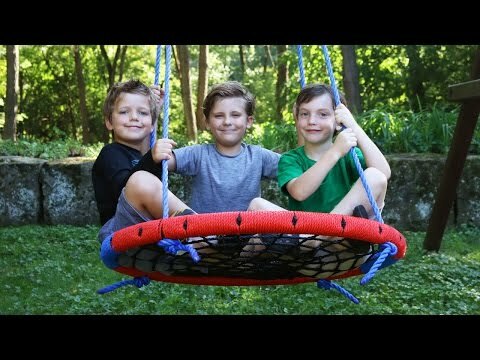 This outdoor disk swing has a woven platform for safe play the entire family can enjoy. Safety rated up to 600 lbs. Dimensions: 39" x 39" x 64"
Love Love Love thge very best swing ever made. This is thwe very best swing ever invented. We love it. Purchased this as a gift and the kids love it. 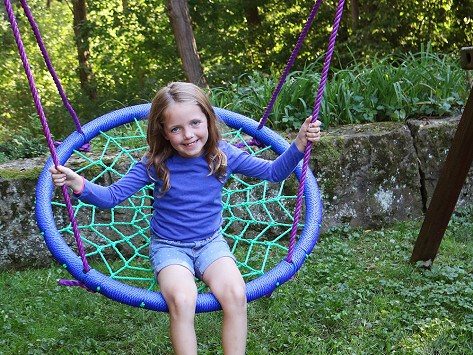 This outdoor disk swing is a real crowd pleaser—literally. It’s strong and sturdy enough to hold a bunch of people at once. WebRiderz has an inner mesh area with a dream-catcher-like design for you (and a few friends) to ride on. It comes fully assembled—you just have to figure out where you want to mount it (think: trees and playsets). Hang it from two points for a traditional back-and-forth swinging experience, or attach it to one point and sign up for a swirling, merry-go-round kind of ride. Makers JB and Dana Priest are committed to getting families outside and active. WebRiderz not only encourages a good time, but also good workout. It’s a sneaky way to practice your balancing skills while you have fun. Whether you swing, spin, or soar, WebRiderz is the perfect platform for play.